Students at universities endure a variety of stresses including social anxiety, exam stress and burn out which are particular to their community. 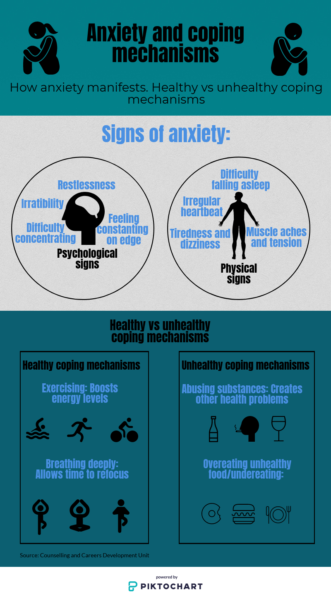 These issues need to be addressed and dealt with in a healthy way, according to Wits psychologist and lecturer, Enid Schutte who added that anxiety is a reality for students. “If we don’t deal with it or provide solutions for students it will lead to depression which could lead to suicide,” Schutte said. The South African Depression and Anxiety Group (SADAG) defines social anxiety as a persistent fear of social situations. This is relevant to students who arrive at Wits, especially in first year, as the social setting can be very intimidating and scary, according to Schutte. Wits’ Counselling and Careers Development Unit (CCDU) offers a variety of services to students such as counselling sessions or therapy services if they experience any form of anxiety or are concerned about mental or emotional health in general. The oranisation, with offices on West campus and Education, offer one on one sessions with registered therapists. The Faculty of Health Sciences also offers a specialised service to health science students in the form of the Office of Student Support (OSS). Ntsiki Mapukata, head of OSS, said that there is emotional support for health science students who are experiencing wellness issues. “We offer psychotherapy and refer students to external providers if they require psychiatric intervention,” she said. OSS currently have one therapist on site but will be engaging a second therapist in May this year to cope with increase in demand for the service. On the Wits Education campus, Wits alumna, Phindi Pactia, has created a non-profit organisation called Adopt Yourself aimed at assisting students with emotional support throughout their degrees with the help of a mentor programme. Head of initial teacher education, Associate Prof Lee Rusznyak, told Wits Vuvuzela that the Education campus is becoming a more supportive space for students. “Myself and five other lecturers are attending training next week to become a Safe Zone Allies.” A safe zone ally is an individual that a member of the LGBTQ community can go to for support. The attitude of Education campus towards students is to “provide support for all, not only the ones that need it”, said Rusznyak.